They’re at it again! 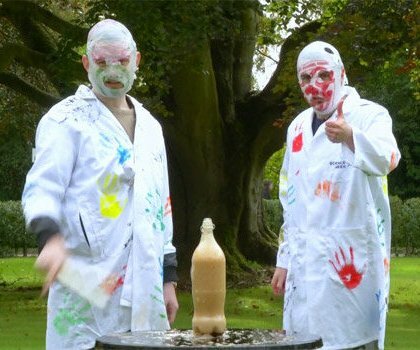 Limerick’s pride, The Rubberbandits, are promoting Science Week 2012 in a new hilarious video in which they interview an immunologist from the Department of Biochemistry at Trinity College Dublin. The lads - Blind Boy Boat Club and Mr Chrome - sat down with Dr. Luke O’Neill in order to get to the bottom of the age-old question - does Christ himself haunt the Eucharist served at Mass? “Do you think that one day science can prove that Communion wafers are haunted with the ghost of Christ?” the lads asked the amused doctor. See if they find out their answer about the Eucharist and Christ, and learn a little more about science, in the video below!